This cruise was, for us, quite a different experience from our other cruises, mainly because it was an American cruise line. I mean, first and foremost, we felt as though we were the only Brits on the ship, which, btw, we loved! But it was a big, big ship (we won’t go on one that size again). And because of its size it had many restaurants, the majority of which we tried out. What we didn’t like was the main dining-room where people dressed up on Gala nights. There was just something about it that made us feel ill at ease. We went once and that was it. Here’s a little video of that occasion – my birthday! As ever the staff were lovely and made the whole cruise a delightful experience. And this is me on my birthday outside on deck – it was a bit windy to say the least! 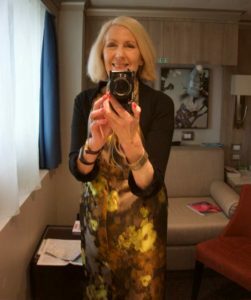 But this was very different to our usual experience of cruises, where there’s just one main dining room with one sitting, with me dressing up practically every night. So instead of gong to the dining-room we went to a fusion restaurant (twice), an Italian restaurant (also twice), a New York pizza place, and Dive In by the pool where we had excellent burger and chips. And more often, the buffet area (called the Market Lido) which was actually so much better than the dining-room because of its floor to ceiling windows high above the water-line. We did try to get to one Gala night, but as the dining-room was on Deck 2 and it was a bit of a lumpy sea, I took one look out of the dining-room window, felt as though the sea was practically at the level of our table, and nearly threw up! It was much, much better to eat higher up and away from all that. Take a good look at the sea in the pic here. This is Deck 7. Now just imagine that sea on Deck 2 with a lot of movement of the rolling kind, plus a Force 7 wind. I admit to not being that good a sailor, but the dining-room was far too near the sea for me! 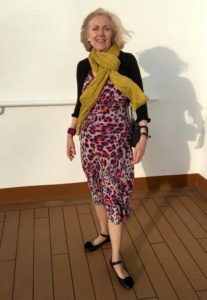 Btw, I am wearing one of my cruise frocks, but you wouldn’t know it as I’m wearing two cardigans over it – even in the Market Lido it was too cool to bare my arms! I was keeping my amazing Masato dress for at least one of the 3 Gala nights (we didn’t go to any). Here’s me in the cabin getting ready for one of them, and note the black bolero cardi, which was an absolute necessity! But in the end I wore it twice, once in Tamarind (the fusion restaurant) and again in the Italian restaurant. Here in this pic below I’m putting the dress on for a second time. Umm, note the hair. What a disaster! I thought I’d treat myself, so what did the hairdresser do? Gave me a Shirley Temple type hairstyle – not suitable in my eyes, and it didn’t wear off well, either. So I washed it out the next day – what a waste of money! So, what is my verdict on not being frugal and instead getting a bespoke dress! First of all, you do feel special. Masato really cares for his clients and gives very personal attention to your wishes and needs. But I also feel that bespoke clothing is a very ethical and carbon neutral way to wear clothes. Because think about it – this dress has been handmade in England. The material is just such an out-of-this-world heavy satin and you feel amazing walking around in it. Even better is that I have the coat to go with it, which I bought 18 months ago. So I shall look out for a suitable garden party to wear the whole ensemble – see below for another pic of the dress and me celebrating entering my 8th decade! And this is why I like cruising in the north. 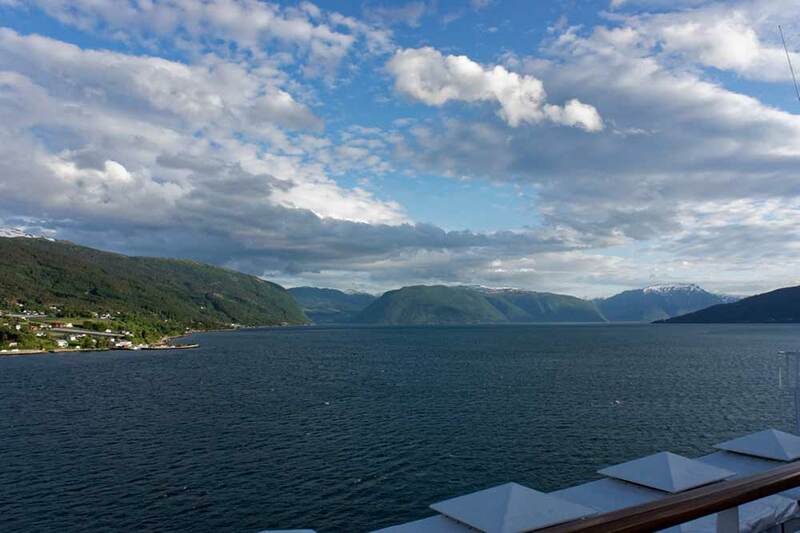 And a final pic of Norway. That’s all for now, but I’ll be posting the June film night outfit tomorrow as there are only 30 days in June and I must squeeze it in! P.S. Linking up with Catherine and her weekly #iwillwearwhatilike session. I think your hair looks fantastic like that, Penny. Really soft and flattering around your face, though I imagine it would drop out quick in the damp. And the dress and yellow scarf is really glam too. It’s a colour few people can wear (I can’t) but it really lifts you. Thanks so much Umi and yes I love that colour and don’t wear it often enough. 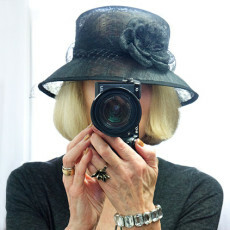 And the hair – the thing is Mr Frugalfashionshopper’s first reaction was shock, as was mine. But now I’ve had other responses like yours I’m actually thinking of i) going white, ii) growing my hair and iii) having a perm to go curlier. Just might do all that! Congratulations on turning 70 Penny and all the best for this new decade! Penny – you look absolutely gorgeous! I really love the hairstyle, it’s very flattering and works very well with the shape of your face – do give it another try. 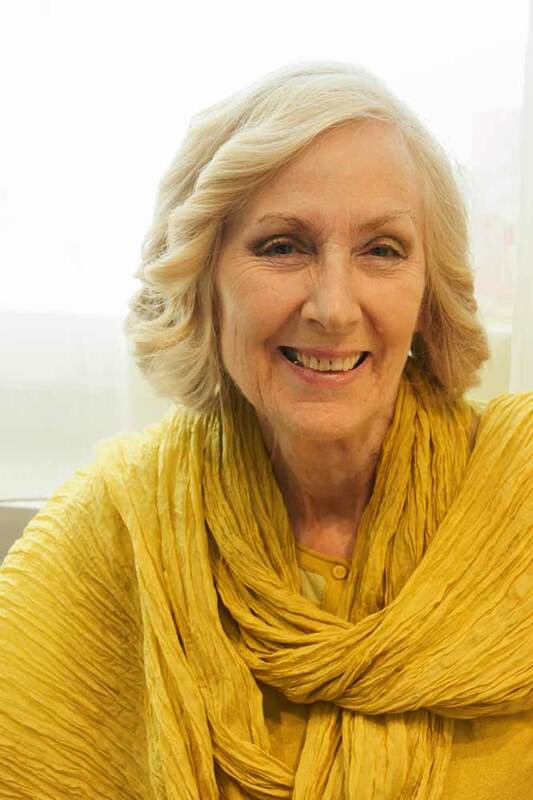 Also love the gold/chartreuse colour – an amazing colour which very few people can carry off but you certainly can. 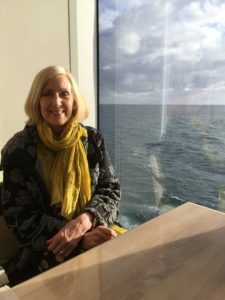 Interesting analysis of the cruise which I will add to my research on whether or not cruises are for us – still quite tempted. Thank you so much Sue, see above response to Umi. The thing is I just reacted a bit negatively to it on the day, but with people saying it looks OK I might just grow my hair, go white and have a perm to keep the curls going. 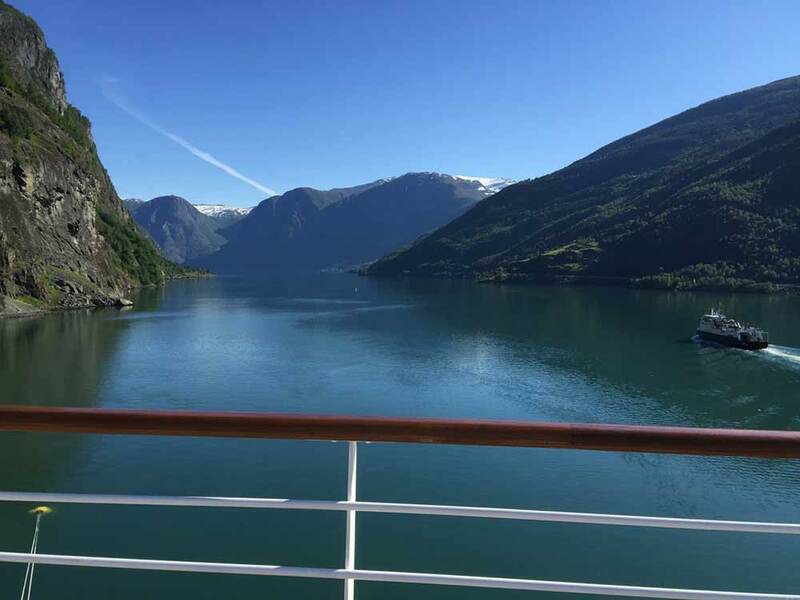 Re: cruises – choose the cruise line wisely and go for a small ship. There are some high-end cruise lines you don’t see advertised much like Swan Hellenic and Saga that I’d recommend for a first-time cruiser. Don’t go for a bargain basement cruise – there’s usually a reason for the low prices! Penny your hair is beautiful and very fashionable.i love your dress and scarf,it’s so your colour.hope you had a wonderful birthday. I agree with all the other comments; my first thought was how fab your hair looks! You really rock the yellow/ gold scarf, too. 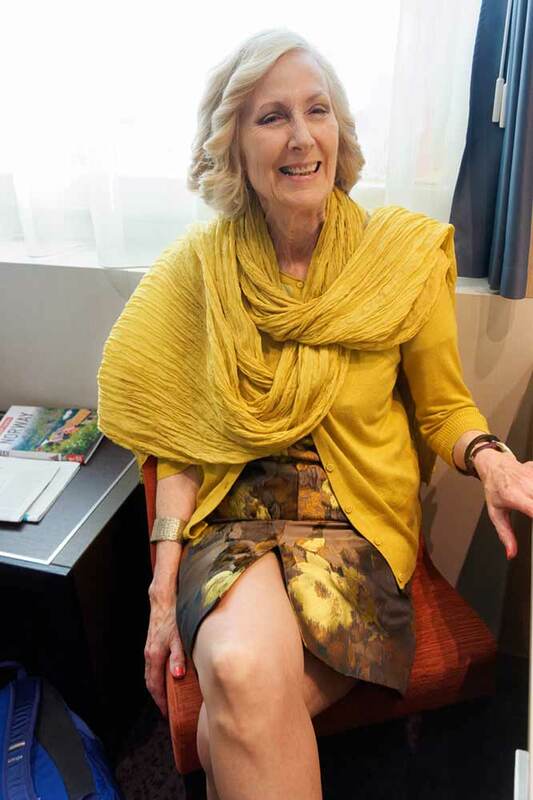 What a lovely outfit and you look so glamorous – and not at all 70! Belated birthday congratulations! Like you, I shop mainly at charity shops but unlike you I haven’t managed a cruise yet – it’s on my list to do, though! You look very lovely Penny and I echo others comments on the colour of the dress that you wear so well and your hair. You certainly don’t look 70. Your outfit is beautiful and your hair is gorgeous, very soft and flattering. The close up photo is lovely, you look years younger than 70.